Easy delicious nutritious smoothies they are my favorite since I got a blender to make them with. 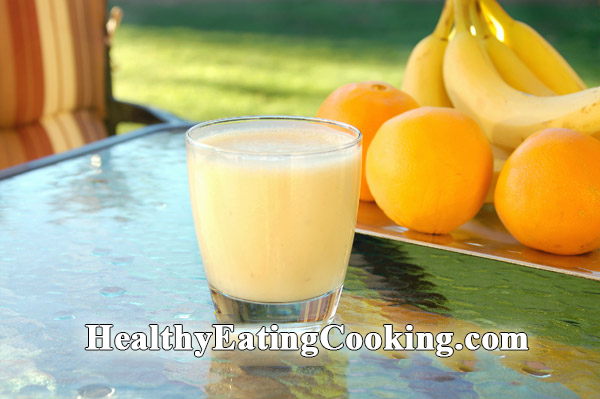 Smoothies are a mixture of blended fruits, vegetables or a combination of both. You can add to it nuts, honey, chocolate, milk – a matter of taste and choice. Smoothies are very nutritious and for me they are a better option than juices. During juicing part of the nutritional value in the fruits and veggies is destroyed and another part gets thrown in the trash with the leftovers from the machine while the smoothies leaves everything good in the glass! This is a very easy and quick option for a breakfast which I often choose early in the morning, especially when I don’t have much time – delicious, refreshing and simple! The fruits and vegetables get cleaned and cut and for a matter of a few minutes you have a fresh smoothies you can eat right away. Here it is important to make a note – smoothies look like a liquid but they are actually food and there is a large difference between both! Generally smoothies are made by fruits so be careful with the calories here! Why do I prefer to turn some vegetables into a smoothie rather than bake them? Plants have a membrane containing cellulose. There is one enzyme that can digest it and it is located in the intestines. It can help dissolve cellulose to substances that can be assimilated by the body. Cellulose is important for the work of the intestines and for the blood system. It is low in calories and is slowly digested which creates a feeling of satiation. When you make a smoothie, the membrane of the cells gets broken and it helps assimilate the useful nutrients in it. The same happens during baking but because of the high temperature it is not very nutritional. The second reason are the fibres. We’ve all heard of them and why they are so important. When you take food in its solid state the body needs more time to digest it and assimilate it but when you put it in the blender for a smoothie the body will need much less time. Also, after baking, fibres are not as nutritional as raw. Now it is time for some of my favorite smoothies recipes! 1. Banana and milk. I mix a banana with a glass of milk and some cocoa. And the result is a divine drink with a banana-chocolate taste! If the bananas and milk have been cooled in advance, it tastes a bit like ice cream that has started to melt. You can also put other spices like vanilla or you can put honey to make it sweeter. You could prepare the same drink with yoghurt. 2. Apple and banana. You take one apple and one banana, the apple is cleaned and cut into pieces, and you blend them together with some cinnamon. 3. Carrot juice. I used to buy it in a bottle from the store but with the blender I can make it myself now. I just blend one carrot with some table water and that’s it! 4. Pumpkin, carrot and apple. The pumpkin is raw of course. A piece with the size of a small lemon is blended together with 1 carrot and 1 apple. 5. Carrot, banana, pear and my favorite raw dries algae AFA. I take 1 of each for every fruit and vegetable and blend them. Then I add 1 tea spoon raw dried algae AFA. And then it is time to drink it with pleasure. For more free information you can follow me in GOOGLE + and my group in FACEBOOK – NATURALLY HEALTHY.